Google Chrome comes with a decent password manager that remembers all of your online login details, if you want it to—you can call them up any time from the Settings tab in the browser. 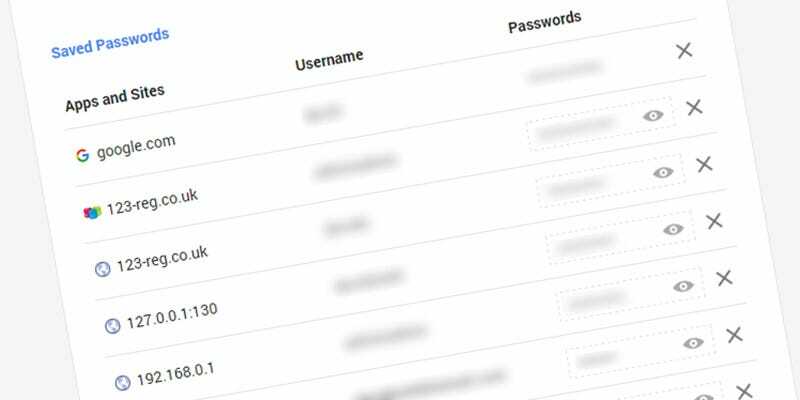 This same database of username and passwords also lives on the web, letting you to bring up a password you’ve forgotten or delete redundant ones. The web address you want is https://passwords.google.com. You will of course be asked to sign in, and then your stored and synced passwords are all displayed in one master list. Click the eye icon to view any of them or the cross icon to delete a particular entry (you’ll need to sign in from scratch the next time you open the site in question). Passwords are only stored here when Chrome sync is switched on and you’re signed into your Google Account: the relevant option is under Show advanced settings and Offer to save your web passwords in the Settings tab of the desktop browser and in Save passwords under Settings on the mobile Chrome app. To disable password saving for one particular site, choose Never when prompted.